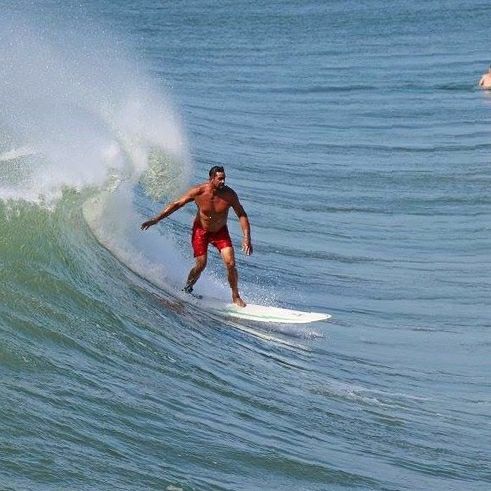 Schub Surf School was founded by Justin Schub who has been surfing for over 30 years. The Schub family is known for the generations of surfers that have trickled down since the late fifties. His uncle started the Schub surfing legacy in 1957. The legacy lived on through Justin's parents who spent their whole life surrounded by the sport. Justin's mom, Beth Schub was the District Director of the Eastern Surfing Association for 20 years and continues to surf with her husband, Greg to this very day. Needless to say, Justin has grown up in and around the ocean his entire life. Justin went on to competitively surf for 25 years. He is a former east coast and national champion who went on to fulfill his dream of becoming a professional surfer. He has now created the opportunity to give back and share his knowledge of the sport that has given him so much joy throughout his life. Jason Asdenti of Harkers Island North Carolina was raised a waterman. His every day life consists of thriving and existing from our Oceans. Jason began surfing when he was 13 years old. He has spent many years exploring the east coast, looking for ideal surf breaks, riding the waves and surfing competitively. He thrives in the adventure of finding the perfect surf breaks for himself as well as for his students. Surfing is clearly a huge passion of Jason's. He thoroughly enjoys sharing this passion with others and helping his students reach their goals! Surfing has been a part of Bill Shelton's life for as long as he can remember. He is a second generation surfer as his dad is the reason he started surfing in the first place. Bill has grown up on the Crystal Coast surfing some of the best waves the east coast has to offer. Bill has surfed competitively in contests for 10 years and has back-to-back final finishes at the 2011-12 Easterns East Coast Championships. These days, Bill travels constantly to surf. Surfing has become Bill's lifestyle rather than just something he does for fun. He is here now to pass the stoke along to anyone who would like to see what surfings all about.